The smart sensors are all now supplied with ON/OFF control options via a Digital Output (DO) as standard, which can be enabled/disabled via a number of methods to suit various application types. These applications range from environmental control, satisfying a temperature, humidity or CO2 setpoint to non-environment control actions such as switching off lights or providing a fresh air purge for a set period of time. The flexibility of control options make the sensors the perfect choice for office and classroom environments to maintain comfort conditions, aiding the productivity of the occupants. The methods are set up via the BACnet communications of the smart sensor. Flexible timer options are also available to manipulate the timing of the DO switching to suit the application. The sensors allow for activation of devices such as fans and lights upon the digital input being enabled via PIR occupancy sensors or local switches and push buttons. The sensors already benefit from native communications providing complete interoperability with third party BACnet MS/TP and Modbus RTU products. 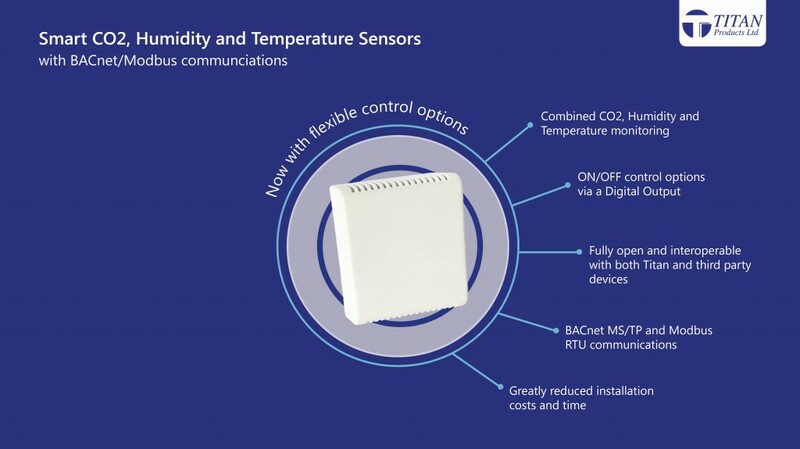 Powered from a 24V supply, the Smart sensors allow for cost savings with all CO2, Temperature, Humidity and control actions readings exposed via one communications cable which is monitored via the building BMS or a network controller. All products are UK designed, developed and manufactured and our on-site R&D team always strive to improve products to provide customers with more options in terms of product selection and flexibility. These new sensors are an exciting new development which offer a sensing solution for traditional 0-10V wired or BACnet/Modbus networks.